The VISION behind Solomon Source and the Vision Excelerator has been in development for over 30 years since Dr. Skadberg's first "real" entrepreneurial experience with Odin Associates, and the Odin Cyclecar. However, specifically, one can find a relatively comprehensive summary of all aspects in the VISION book, *Free e-book, 462 pages) linked below. 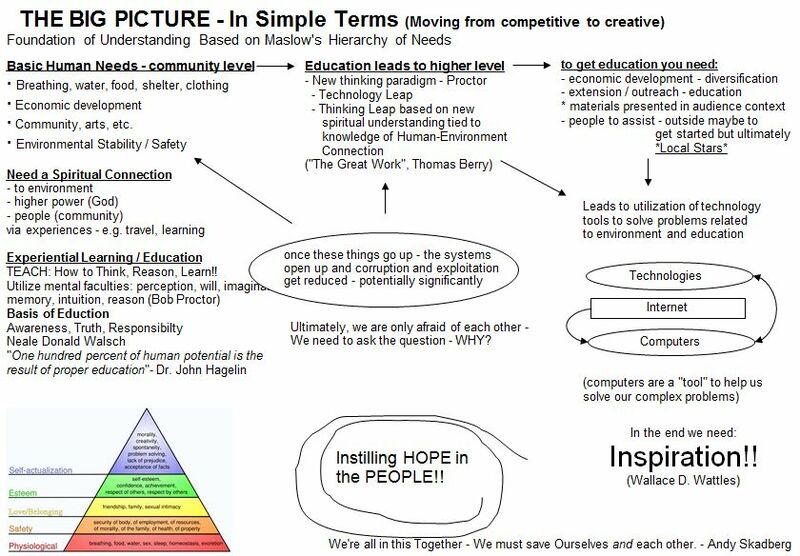 These are the compilations of a life´s work - ideas for solutions to the world´s challenges. The strategies described in various sections can be implemented as individual components, comprising a very good regional, or project strategy - standing alone. But the entire book is a whole vision, for developing new models for civilization, built upon solid theories, but also the Universal Philosophy as espoused by Albert Schweitzer - that being "Reverence for Life" (also the Golden Law, as taught by Jesus). The first sections describe the motivations for writing this book, and establishing the various philosophical and theoretical foundations. Maslow's model as a conceptual foundation is a good start, however, over the years we have come up with some ways that it may be adjusted. It is not the point here to go into a lengthy discourse, however, we would like to introduce these possibilities to the reader. The first is that in our personal experience, and our observation of people, that there are opportunities to catalyze individual evolution. The term fairly commonly used for this would be "spiritual awakening". 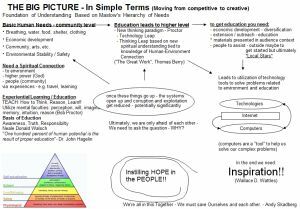 We believe there are increasing potentialities to raise people out of the lower levels of the Maslow's pyramid and allow them to experience dramatic transformations. Our approaches, especially related to empowerment will readily embrace these possibilities, although we understand in scientific circles these are difficult to support. We however remain open to those possibilities because in a very real sense, we think that real empowerment, and a wholesale transformation of human life on Earth is going to require the introduction of influences that fall way outside the paradigmatic realm of "modern" science. A second point relates to this idea adapted to the collective experience. We are recognizing as a real possibility that we may be able to stimulate with our RRES, a paradigmatic shift for the communities that we work with. To use another phrase would be a "technology leap". Our hope is that we take the lessons that we have learned from our work in the United States, which some would suggest had "advanced" ahead of developing places, that the lessons learned, especially in regards to mistakes, could be avoided. A specific example is where we are currently deploying the RRES in Colombia S.A. One of our team was originally from Colombia, but spent most of his life in the U.S., stated on a number of occasions that the U.S. is 30 years ahead of Colombia. I would argue that those 30 years are necessarily in all positive ways. In fact, regarding food and agriculture and other systems I believe developments have become more and more problematic. Many examples could be provided. The point here is the hope that we might be able to take the lessons learned, mistakes and/or successes from one place (e.g. United States), and help another place avoid the same problems, or implement the successes. This potentially could even contribute to, or stimulate, a paradigm shift and/or a technology leap, in essence advancing that place and its people ahead many years of potential trials and tribulations. We see this happening in numerous places around the globe, so this is not just a "pipe dream".